As the ADAA community on HealthUnlocked turns one, we spoke to Susan Gurley, ADAA’s Executive Director, about the past year and what the future holds. How many people suffer from anxiety or depression globally? Anxiety disorders are the most common psychiatric illnesses affecting children and adults. Globally, the total number of people with depression was estimated to exceed 300 million in 2015. Anxiety currently affects about one in 13 people (7.3 percent) worldwide. An estimated 40 million American adults suffer from anxiety disorders (including depression). Only about one-third of those receive treatment, even though the disorders are highly treatable. What are some of the main challenges that people with anxiety or depression often face? People with generalized anxiety disorder (GAD) experience excessive anxiety and worry, often about health, family, money, or work. This worrying goes on every day, possibly all day. It disrupts social activities and interferes with work, school, or family. For many, it is often very difficult, either due to geographic or financial constraints, to access quality mental health treatment. As a result, many go undiagnosed and their symptoms worsen. We believe that bringing people together with the same health conditions can be life changing; do you find that on your community? Absolutely. We have seen enormous organic growth on the ADAA online HealthUnlocked community since our launch in November of 2016. We now have 10,000 subscribers from around the world. We receive emails from members that highlight how beneficial – and in many cases life changing – the community has been. For many who don’t have easy access (either due to geographic or financial challenges) to mental health care, sharing their stories and struggles with peers on the HealthUnlocked community has helped them find support and invaluable information. What kind of support is being offered on your HealthUnlocked community? ADAA posts/pins a variety of resources on the HealthUnlocked community. We share blog posts authored by our ADAA professional members, webinars on a variety of anxiety and depression related topics, articles and links to our website and other organizations, infographics and more. Two of ADAA’s professional members also hosted a live “Ask the Psychologist/Psychiatrist” chat this past May that many on the community participated in. Why is online support so important? Online support provides the subscriber with an anonymous peer-to-peer anxiety and depression community that is a friendly, safe and supportive place for individuals and their families to share information and experiences. ADAA HealthUnlocked community members can connect with other people – from across the US and from around the world – experiencing anxiety and depression and related disorders just like them. They can contribute to ongoing conversations or start their own conversation with a question or a post about their journey. The community bridges geography and time zones and offers help and hope on a daily basis to so many. How does your community help support the needs of your organization? The ADAA HealthUnlocked community provides another valuable resource for all those that come to our website, or engage with us on social media or through our email newsletters to find support and hope. The HealthUnlocked community supports ADAA’s mission to improve quality of life for those with anxiety, depression and related disorders. We do this by providing education about the disorders and helping people find treatment, resources, and support. What difference do you think the Anxiety and Depression Support community has made to people with Anxiety or Depression in the last year? The ADAA HealthUnlocked community has made a huge difference to the more than 9,000 current subscribers. The community provides them with a “listening” forum and a place to share experiences, learn from others, and feel less alone in their struggles. They also have access to helpful resources that we post/pin in the community. Below is a graphic detailing the answers to a poll we posted four months ago – in addition to this online community, where you do you find the best support? The answers clearly indicate the great need for this type of online community. 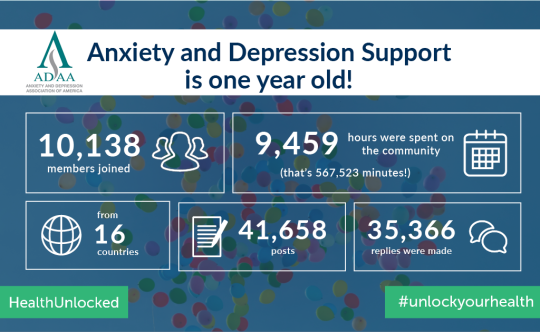 What have been some of the most memorable moments of the Anxiety and Depression Support community of the past year? Knowing that ADAA is providing this forum to those in need is something that our staff, our board and our members can feel wonderful about. Everyone was very energized by the May live HealthUnlocked chat event and our ADAA professional members loved being able to answer questions and provide support in real time – they could see the immediate, positive impact that they were making first hand. We’re looking forward to offering another similar event in 2018. Our HU members were also very excited when the HealthUnlocked team launched the iPhone app for the community! What does the next year hold for ADAA and the community? We are excited to have just launched (in late September of this year) a brand new Spanish language ADAA HealthUnlocked community – ADAA Grupo de Apoyo en Linea. We have engaged a number of our younger Spanish speaking ADAA professional members to work with us as site ambassadors and they are collaborating with us to increase our outreach to the Spanish-speaking community. We know that this is unique resource for the Hispanic community and an invaluable one and that member numbers will grow throughout the year. We plan on hosting a live chat on the Spanish community and sharing Spanish webinar and blog posts that we will be providing throughout 2018.